In the South Wales town of Cwmtaff Shelly Bush, a fiery, intelligent girl whose mother died of a drug overdose leaving her at the mercy of harsh 'care' system; Sam Taylor, who seems adept only at getting life wrong and Mary Croft, a gifted A level student who feels alienated from her father, after the death of her mother and betrayed by her boyfriend find their stories coming together as insists on hope and rebellion in the face of overwhelming odds. 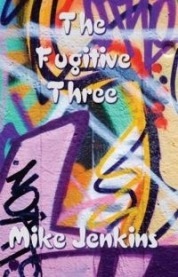 Sharp, funny, fast paced and precisely executed The Fugitive Three is a dazzling display of dialect, plot and characters who, despite their flaws, are completely believable and eminently likeable. Available now in book shops or from the Cinammon Press website. This article appeared in the Western Mail on June 28, 2008. The local paper got it wrong and called my novel The Fugitive Tree. It fitted neatly with the accompanying photo of myself next to the oak in my garden. Sometimes, things going awry can really lead somewhere though. Together with my friend - poet and playwright Patrick Jones - I was working a decade ago on story-lines for what became the ITV Wales soap, Nuts and Bolts. We were told it would be a drama and came up with numerous ideas, a few of which were eventually used. But the inspiration for my first-ever novel, The Fugitive Three came from these stories: in fact, one of my characters appeared in a very different guise in the opening episode and was duly killed off (she jumped from a viaduct). My character Shelly jokes that if she were in a soap opera she'd be "killed off in the first episode"! Nine years ago, when I began writing this novel, I was teaching in the notorious Gurnos estate in Merthyr. Every day I took the bus home, passing the kind of care home where Shelly once lived, the houses where Sam Taylor (a no-good-boyo) would've stolen from his mam and the flats which were boarded up and soon to be demolished, like the one reclaimed by the three runaways of my book. I passed Prince Charles Hospital where Mary Croft has to be rushed and the detached houses of Penydarren where Mary, a sixth-form student, would have lived with her father and the presence of her dead mother. In the novel, I've made Merthyr into Cwmtaff, a similar but not identical place. My three protagonists are all escaping from something: Shelly from a rapacious landlord, Mary, an unfaithful boyfriend and Sam, the consequence of his misdemeanours. Shelly is the catalyst when they finally meet. I've taught pupils like these, but they're not based on specific individuals, so I don't expect anyone to come looking for me as one irate boy did when I wrote a poem about a schoolboy who flashed with a cucumber on his "plonker". There were some, like Shelly, rebellious and feisty, with great talents never nurtured by the school (through no fault of its own); many like Sam, who lived for the moment and grabbed what they could to survive; others like Mary, who appeared comfortably off yet struggled with personal loss. The names aren't meant to be clever connections with the Romantic poets. We're in an age where naming can be very important and I've taught pupils named after the hotels where they've been conceived. I've been quite deliberate: Shelly has much of the revolutionary ardour of the "poet bloke" she's named after, Mary has created her monster in the form of the relationship with her boyfriend and Sam has his own hallucinatory experience involving birds while on drugs at a nightclub down town. As far as possible, I tried to convey their everyday speech through Merthyr dialect. Like Hardy with his Wessex farming folk, I wanted to get close to the sound and richness of the vernacular. As a stranger to Merthyr, I had to learn the dialect to survive as a teacher. I recall asking one tardy pupil for an explanation. "Now I come!" he answered, to which I replied, "I know....but why are you late?" I realised that "come" meant "arrived". Mary speaks very much like the other two and this is an important feature of Valleys dialect: it runs across socio-economic borders. One place of escape for the three, one scene of joy and release, occurs in an area I could see daily from the comp where I worked. Like so much of the Valleys, my part-fictional Cwmtaff has an area of wonder and wildness a walk away from the estate. Ironically, it's the outwardly hedonistic Sam who knows this land best. It's based on the valley of the Taf Fechan as it flows between the arches of Pontsarn viaduct into a small gorge and the Blue Pool, renowned among pupils as "lush for skinny-dippin'". Ultimately, however, it is Shelly's dream which gushes through the narrative. She wants to transform the estate I call Penybryn. I have witnessed first-hand the striking though at times overtly propagandist murals of Belfast and these are very much the people's art. Shelly's vision, on the other hand, is an individual one (always influenced by the lives of the other two). It represents - as Swansea poet Dave Hughes says in his poem Flowers about Graffiti Art - a chance to bring colours to the wasteland.